Sunday in Berlin seemed like a good day to visit museums. We read through our travel books and decided on two – the New National Gallery and the KW Institute for Contemporary Art. But first, breakfast. 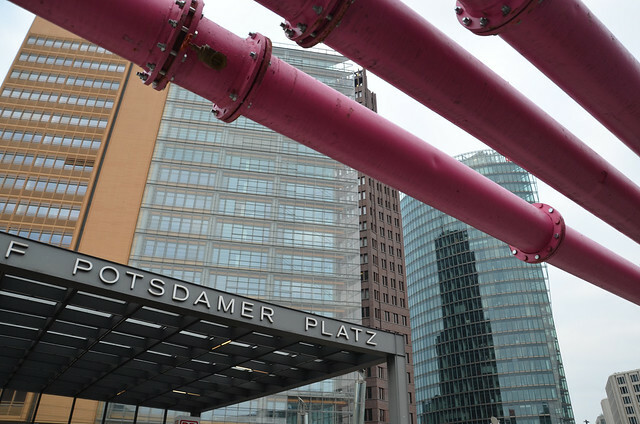 We took our little Uboat (the U Bahn of course) to Potsdamer Platz and found a restaurant. On the way through the square we saw again these crazy pink pipes. What is up with the pink pipes. 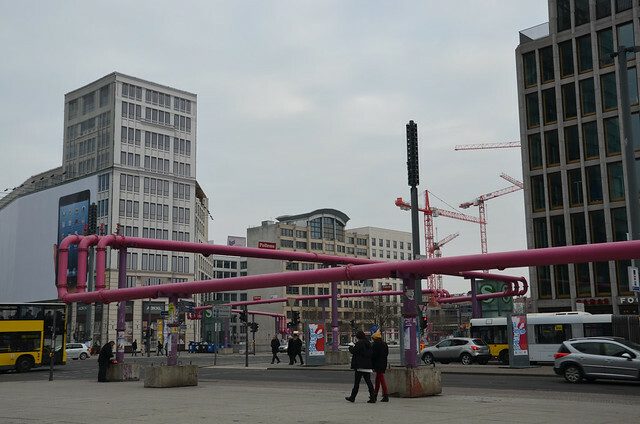 Is this an eyesore that has become a symbol of Berlin? If you know the story, please let me know. After having yet another fresh and healthy Berlin breakfast, we walked to the first museum on our list. We thought we had the wrong address. The building was empty. 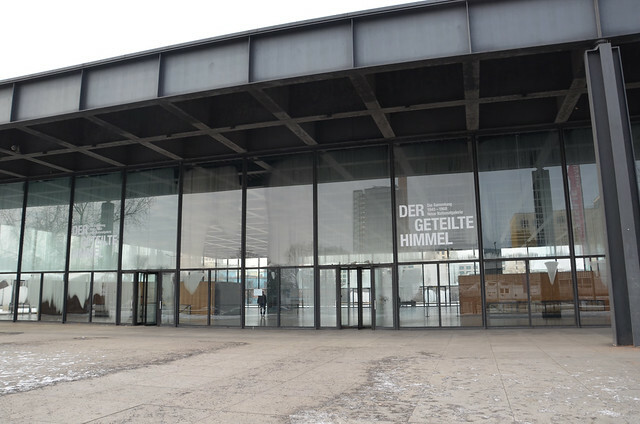 How could a museum be empty? We checked the map again and decided to try the doors and see what it was. Does this look like a National Gallery to you? There were also some Andy Warhol paintings and other famous things. I don’t know enough about art to give you a review of this museum. It’s not very big and took us just over an hour to see what we wanted to see. Worth a visit, but not a highlight of our day. 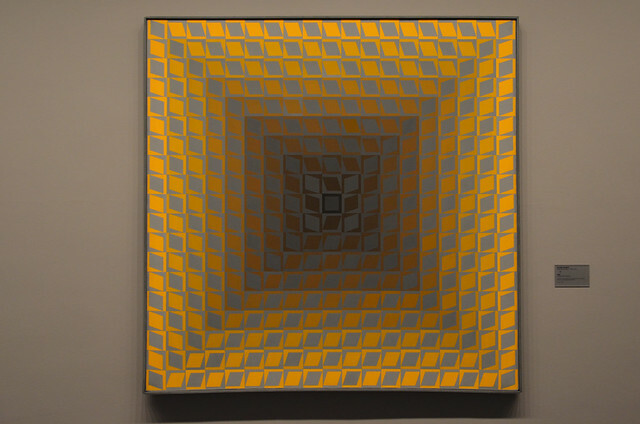 I want to try to make the above patchwork 3D painting with fabric or yarn. Wouldn’t that be cool? We then headed north to the North Train Station where DB had read that there was an interesting museum. We didn’t find the museum but we did find a monument to the Berlin Wall. On the left side of this photo is where the wall stood. These metal rods are part of the artist’s rendering of the wall. To the left was West Berlin, to the right first no-man’s land, then East Berlin. 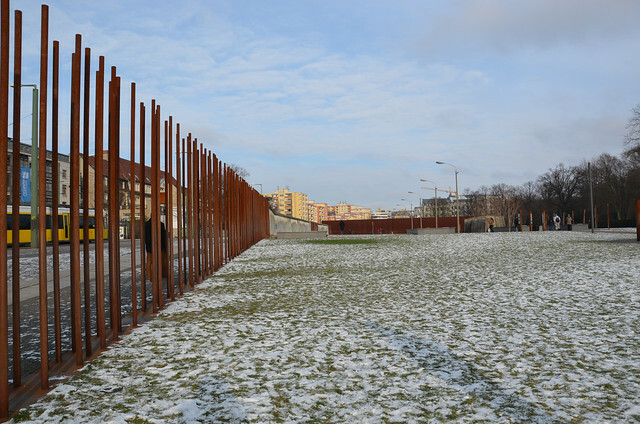 This monument runs for many blocks north, showing parts of the wall and super-sized photos from 1961 to 1989 on buildings that sat next to the wall. It was very impressive and really brought home the kind of world people lived in during that time. I wonder how strange it must be for older people who live in this neighborhood and who have lived there all their lives. What changes they have seen! 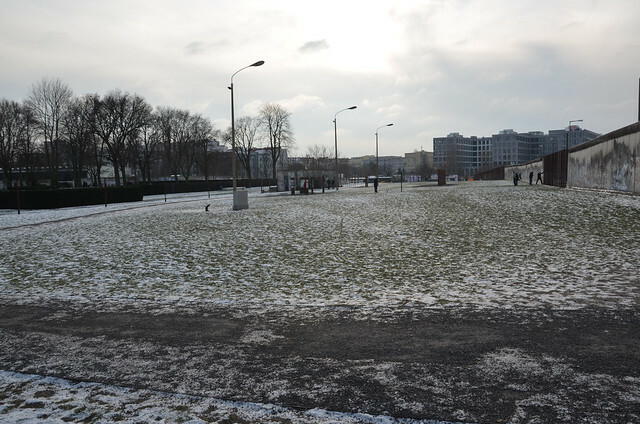 This photo is looking south, with the old East Berlin on your left, the wall on your right. The inner wall used to run along the tree line to the left. This is looking straight down no-man’s land between the two walls. Rarely did anyone make it across. After walking along this street for many blocks we had to find somewhere warm to sit for a while. 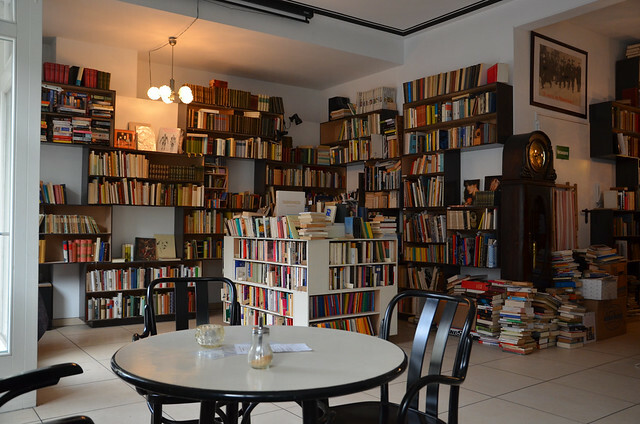 We found this very cute used bookstore and cafe combination where we were served huge pieces of chocolate pear cake. Back down to the subway and over to the KW Institute to see some more art. 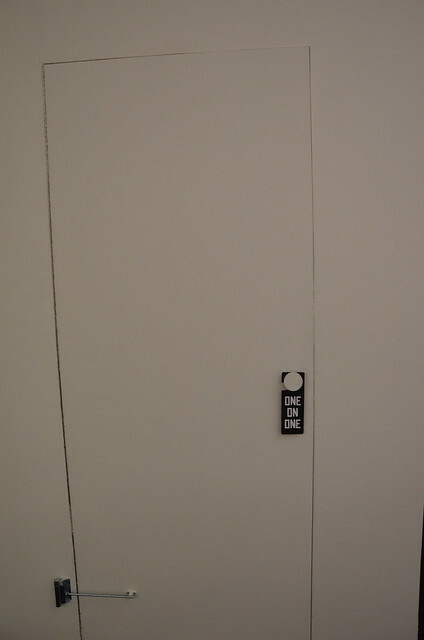 When you paid your entrance fee you received a paper door hanger that had One on One printed on it. 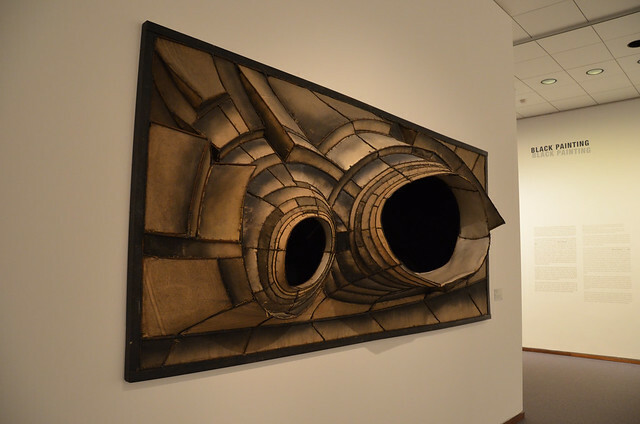 The idea of this art exhibit was to go into each small room that was built into the larger exhibition space and experience the art all by yourself. Some of the rooms were very small. Some were large enough to walk around and do gymnastics. It got pretty busy and sometimes you had to wait in line for your turn to go in and see what was inside. It was funny to see how long people would wait for their turn. 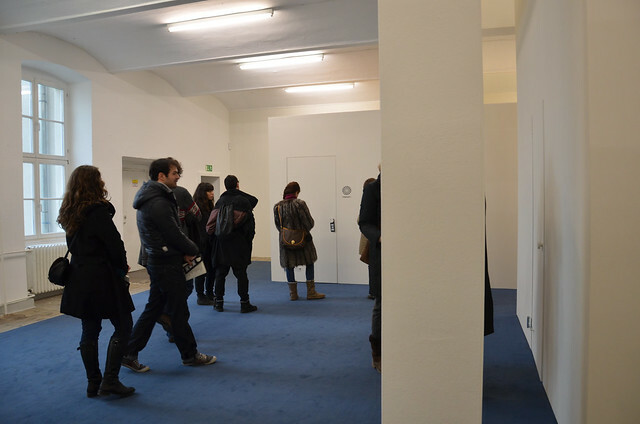 We passed up seeing a couple of the rooms because the line was just too long and not moving very fast at all. We aren’t very patient. And our feet hurt. What did we see? Funny things. Most of the exhibits made me smile or laugh. A few just made me shrug my shoulders and wonder WTF? None of it was mind blowing or even very thought provoking. Just fun. Worth seeing if you are in the neighborhood, or if you like seeing how young artists spend their time. And then, of course, it was time for food and a warm bath. Yes, I took advantage of our giant room and bathtub and had a soak when we got back to the hotel. And THEN it was time for some Mexican food! We went to Santa Maria Mexican Diner, at Oranienstrasse 170. It was small and packed! We had to wait 30 minutes for a table but enjoyed some tasty margaritas while waiting. It was seriously good Mexican diner food! Better than I’ve had in Amsterdam anyway. I would definitely go back there and if I lived in the neighborhood I’d make it a regular hangout. DB especially liked the music. A win-win situation for sure. And that was Sunday in Berlin. We’re due to fly out Monday at 6pm but with the weather reports looking ominous, we’ll see if we make it out or not. It’s supposed to snow again. Stay tuned for the next episode of Escape from Berlin…..
How odd! Also, just wanted to say how much I enjoy reading about your adventures. Keep up the great blogging! Thanks for reading my little stories. It’s so fun for me to hear that people really do read it (besides my mother).